Asynt has introduced GasTrap gas purifiers for analytical laboratories using Gas Chromatography (GC), High Performance Liquid Chromatography (HPLC) or Mass Spectrometry (GC/MS) instrumentation. How Does Nanotechnology Improve Chromatographic Columns? Gas purity is essential in any GC, HPLC or GC/MS application requiring high sensitivity. 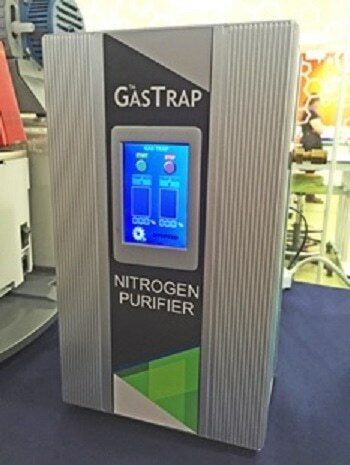 Available in optimised models for Helium, Hydrogen, Nitrogen and pure air - GasTrap gas purifiers dramatically reduce the levels of contaminants, enhance the purity of lower grade helium, and help ensure instrument stability, reproducibility as well as lowering running costs. Laboratory gases for GC, HPLC and GC/MS are typically supplied in pressurised cylinders that contain trace impurities. Even with speciality high purity gas supplies trace contaminants of up to 20ppm Oxygen, water, Carbon Dioxide, Neon and Argon are present which increase proportionately as the cylinder pressure drops. Unlike disposable gas filters that are time consuming, costly and cannot remove gases such as Neon, Argon or Nitrogen, based upon patented Pressure Swing Adsorption (PSA) technology - GasTrap gas purifiers remove all of contaminant trace gases and self-clean every cycle. Operated via intuitive touchscreen software, GasTrap gas purifiers can save you up to £2000.00 per Gas Chromatograph thereby effectively paying for itself within six months. In addition disposal of filters is dramatically reduced and using a GasTrap gas purifier - labs can save money through using lower grade gases. GasTrap gas purifiers have been designed to operate automatically for 10 years with no servicing or consumables required. For further information please visit http://www.asynt.com/product/gastrap/ or contact Asynt on +44-1638-781709 or [email protected]. Asynt is a leading supplier of affordable products, consumables and services for chemists in industry and academia. With staff of trained chemists - Asynt is able to draw upon this in-depth applications knowledge to provide a high level of customer support for its DrySyn Heating Blocks, Controlled Lab Reactors, Synthesis Tools, Evaporators, Circulators, Temperature Control Systems, Vacuum Pumps and Laboratory Safety Equipment.